We took several of them for a spin, got feedback directly from elite players, read a number of sources we trust and spoke to the manufacturer and vendor to put together this 2017 DeMarini CF9 Fastpitch Bat Review. We cover the Hope, drop 8, drop 9, drop 10 and drop 11 here. We leave the Jump to the full review. We aren’t the only ones to have information about the CF9. Other places, in particular those who sell bats, usually have a boiler plate write up on the specs of a bat. Many of those we reference to make sure we are seeing what we should be. Here are some more references for the 2017 DeMarini CF9 review. The major, and only, change from 2016 CF8 fastpitch bats to the 2017 CF9 Fastpitch bats, is the change to a stronger composite. The claim is, this new Paraflex composite is 22% stronger. In theory, a stronger composite wall allows for a longer sweet spot, because walls can be thinner for longer without sacrificing durability. Time will tell if the CF9 is much hotter than the CF8, which were arguably the hottest bats on the market. Our gut feel, after using the bats and speaking to others who have---the CF9 will have similar outstanding performance reviews as the CF8. Good news for all. No other brand really drives options like the CF9. In that regard, there are no comparable options. Sure, Slugger’s LXT and XENO lines combined might get you close ,but they would still lack a drop 9 end load. Slugger’s fastpitch line does offer customization options—as they are owned by Wilson, too. Easton, Marucci, Anderson and Rawlings each make good bats in their own regards. Some, like Rawings’ new Quatro and Marucci’s Pure, use a similar light swiging two piece composite concept, but they lack sizing options and pedigree. We spent 2 hours in our cage comparing the 2016 Louisville Slugger LXT PLUS Fastpitch softball bat (Ebay, Amazon Price Check) to other similar designs in the market. 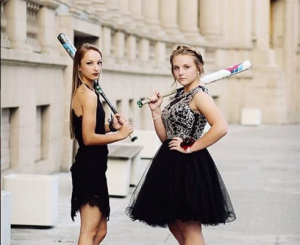 We received feedback from 4 different hitters—each of whom play competitive fastpitch. DeMarini’s CF9 fastpitch line really has an option for each hitter. On the whole, we would only recommend the CF9 to players who are dead serious about being good at fastpitch. 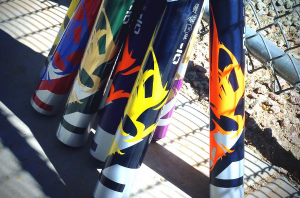 These bats are outstanding devices and serious players will appreciate their pop and balance. The only two real hindrances to our full fledged recommendation is budget and cold weather. They are, after all, premium prices and composite barrels. If you can work your way around those two issues, by all means pull the trigger. You will not be disappointed—as long as you get the right drop. As a general rule, the more experienced you are, and the stronger you are, the heavier the bat should be. New to the game players should look at the drop 11 unless they are 13 or older. Up and comers should be looking at the drop 10—it is the best selling and most popular of the CF9s. The drop 9 is for serious players who can rake. And the drop 8 CF9 is for elite players. Of course there are always exceptions to these rules, but these are good guidelines as a jumping off point. We reviewed a number of sources in putting together this 2017 CF9 Fastpitch review article. Most helpful was our 2016 CF8 Fastpitch write up. As well, DeMarini’s product fastpitch pages were remarkably helpful in confirming product codes and size offerings. We also relied on the large fastpitch section at justbats.com when looking for some anonymous user reviews. Closeoutbats.com was a helpful resource in keeping the color schemes straight. We also took some time to look through Amazon reviews and product offerings in terms of price and Prime shipping. In this article, we also link you to our overall CF9 bat review page. As well, we reference our CF9 Slapper Review and our CF9 Insane Review. We also overview the 2017 DeMarini line here. If there is any complaint about the CF9 from DeMarini, it is the difficulty in keeping the sizing options right. In addition to the four drops of the traditional CF9 (drop 8, drop 9, drop 10 and drop 11), there is also a bat called the Hope, Zero Dark and a few Special Edition CF9s. Additionally, there is a bat called the CF9 Insane and the CF9 Slapper. Setting aside the Insane and the Slapper, each of the other CF9’s are identical according to their drops. That is, the ZERO Dark, which we review here, is a drop 10 or drop 11 CF9. The HOPE CF9 is a drop 10 version with a slight exception to this rule. That is, the CF9 hope uses a different and lighter end cap that makes the swing weight slightly lighter than the CF9 drop 10.